Body contouring with the SculpSure® laser system helps women feel more confident about their bodies by targeting and flushing fat deposits that just don’t respond to diet and exercise. The SculpSure® technique uses no incisions, and there’s no downtime. Dr. Sharon Smith is a skilled practitioner offering SculpSure® body contouring for women at OBGYN Care in Houston, Texas. Start feeling better about the way you look. Schedule an evaluation today to learn more about how SculpSure® can help. Body contouring — sometimes called body sculpting — uses special techniques to treat stubborn areas of fat and cellulite in specific areas of the body, leaving the treatment area firmer, sleeker, and more toned-looking. It’s popular among people who’ve lost a lot of weight and want to refine their final results, and it’s also popular with people who are already fit and toned but have specific areas that remain resistant to exercise. Unlike liposuction, body contouring is not designed to treat large amounts of fatty tissue, and many body contouring techniques can be performed without surgery or incisions. SculpSure® is the first laser-based contouring system to receive FDA approval for the removal of fat in the abdomen and the flanks. Made by Cynosure, the SculpSure® device uses highly-focused beams of laser energy directed through the skin to target the fat cells and damage the cell walls. The resulting fatty liquid and cellular debris is flushed by the body’s lymphatic system in the days and weeks following the procedure, revealing a slimmer, sleeker profile. Is SculpSure® a type of liposuction? No. SculpSure® does not treat as much fat as liposuction. But it also doesn’t use incisions, so patients don’t experience the discomfort and prolonged recovery times associated with liposuction. What happens during a SculpSure® session? Our doctor begins treatment with a review of the patient’s treatment goals and an evaluation of the treatment site. During treatment, the handheld SculpSure® device is passed over the treatment area, emitting laser energy to the layers of tissue where the fat cells are located. A special cooling tip ensures the skin surface remains cool and comfortable throughout the entire treatment session. Some patients report a mild tingling or warm sensation as the laser energy breaks down the fat cells. Most treatment sessions are completed in 30 minutes or less, and multiple areas can be treated in one session. There is no downtime, and patients can resume their regular activities right after treatment. Most women see initial results of their SculpSure® treatment beginning at about 6 weeks after treatment. Maximum results become visible at about 12 weeks post-treatment. 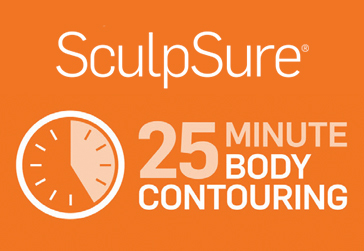 How long do SculpSure® results last? SculpSure® treats the fat cells, and results are lasting. Following a healthy diet and exercising regularly can help keep the entire area looking slim and trim.